Steven Adamo won first place in News Judgment/Layout, third and fourth place for Illustration from the spring semester, a continuing scholarship, and an achievement award for student leadership. Noe Ortega won Honorable Mention for Sports Game Story, as well as a continuing student scholarship. Andrew Ayala won Honorable Mention for Critical Review, a continuing scholarship and an achievement award for student leadership. “At the moment, it feels good to win,” Ayala said. Melody Ortiz won Honorable Mention for Editorial Cartooning and a continuing student scholarship. “I expected to get Honorable Mention, and I got Honorable Mention,” Ortiz said. A total of 309 delegates from 29 colleges attended the convention. Students were not only able to compete, but also network with professionals and attend different workshops. Luis Castilla and Ivan Cazares won Honorable Mention for Team Feature. 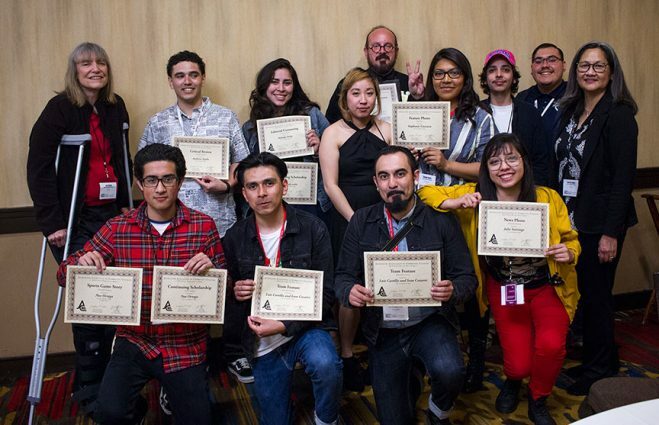 “It was an interesting competition because we didn’t know what we would be covering, and we know we made a couple mistakes, so I think we are happy to be honored with Honorable Mention,” Cazares said. Stephanie Guevara won Third Place for Feature Photo. “When I saw all the Honorable Mentions, and I did not see my name, the first thing that came to my mind was ‘I am not going to win anymore,” Guevara said. Guevara said she went up to get her award and does not remember how she got back to her seat. Julie Santiago won Honorable Mention for News Photo. “I am glad our team was able to bring something back home and make us proud,” Santiago said.